In today's world of tourism and world class consumers, people all the over globe are looking for destinations. They look for places, which are of tourist interest or historical interest or beaches or ski resorts or of lands of entertainment. It is important to know that certain destinations have a brand Personality, which is loved and are aspired for, by most people in the world. Brand Goa is one such loved destination which people aspire for desire for and even perspire for, to be able to enjoy the sun and beaches as well as the festival and the festivities. There is a saying that "There is a time and place for everything", I think that ,the saying comes true at Brand Goa because Diwali, Holi, Easter, Christmas and New Year time is appropriate and relevant and the place Goa is suitable for having the time of your life. In this wonderful place called Goa, with its attraction and action, it has an aspirational quality of being a brand land, which takes you away from the rigours of the world and gives you peace and serenity, and allows you to enjoy the beautiful nature which is God's gift to man. Brand destination is a powerful brand property and few destinations in the world are liked and loved the way Brand Goa is. There could be a Switzerland or a Las Vegas in USA or the Gold Coast in Australia or may be the pyramids of Egypt and of course our own Taj at Agra. Brand Goa, is a brand land which is amongst the top brand destinations in the world and people have stars in their eyes, hope in their hearts and a song on their lips when they plan to go for a holiday in Goa. Brand Goa, is a brand land wherein not only tourism but sports entertainment and even entrepreneurship and industry are thriving and it is increasingly becoming a brand destination not only for vacations but also for vocations. The corporate world continuously make a bee line to Goa not only for training sessions and conferences but also for setting up investments and manufacturing bases at this brand land. Brand destination is a way of marketing your brand land and becoming a strong favourite in the mind and heart of consumers not only in India but all across the world. Build your brand property in such a manner that it becomes a brands destination for consumers. People all over the world travel to Switzerland because of its natural beauty and because it is literally, figuratively and also climatically "cool". People travel to Las Vegas to plunge into enjoyment and seek indulgence. People travel to the pyramids at Egypt to take a journey back into history and discover the past. People travel to Agra to see the Taj, to relive the romance of Kings and Queens and enjoy art and beauty. Every place, which has something to offer to the consumer, can be brand marketed in a manner, which makes it a brand destination. Whether it be Hawai or Powai. 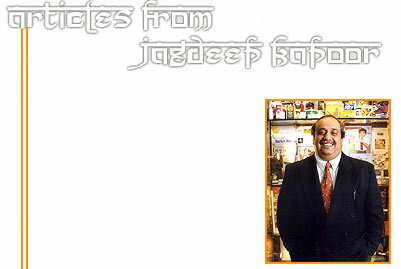 The author is Jagdeep Kapoor, Brand Guru and Managing Director of the successful Samsika Marketing Consultancy.